The Young and the Restless (Y&R) spoilers tease that Nikki Newman (Melody Thomas Scott) will face sobriety issues as she deals with Neil Winters’ (Kristoff St. John) death. She has been able to keep control of her drinking over the past few months, but when she hears about her best friend’s death, she will struggle to stay sober. Here’s what you need to know about what’s ahead on Y&R. The whole town of Genoa City will come together to mourn the loss of Neil Winters. Y&R spoilers say that Nikki will struggle to accept her friend is gone. She will ponder how she will go on without him. First, she lost Katherine Chancellor (Jeanne Cooper) and now him. Paul Williams (Doug Davidson) will lend an ear and let her know that she is loved. He will let her know that while she feels terrible and a sense of loss, her sobriety is worth something great. He will hope he can get through to her, but he prepares himself for Nikki to relapse. 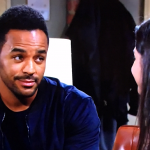 Young And The Restless Spoilers– Will Nikki Take A Drink? The news of Neil’s death rocks Nikki. She will learn that he was in an accident and he died almost instantly. As she speaks at his funeral, Nikki remembers the good times. She remembers his friendship and kind spirit. It is at that moment that she decided that she must stay clean. She isn’t going to stay sober for herself though—she does it for him. She knows that her pal, Neil would want her to stay strong and rejoice in his memory other than feeling overwhelmed by sadness over his loss. So, that’s what she decides to do. The Newmans rally around her, expecting her to be a mess over Neil’s death. She stuns everyone by her positivity and accepting Neil’s passing without a drink. She admits she will miss him and is sad by his passing, but she will be okay and doesn’t need a drink to self-medicate. Do you think Nikki will stay sober when grieving for Neil? Don’t forget to come back later for more The Young and the Restless (Y&R) spoilers, news, and casting updates!